If you recall, last January found us Two Blondes plus another fab female outdoor leader in a rather crowded but chilly Welsh bothy enjoying a slightly unusual (but entirely Blonde) 50th birthday party. Lluest Cwm Bach was, at that point, my favourite of the Mountain Bothy Association Welsh bothies but I have to say that the tiny (and therefore just as crowded) Grwyne Fawr Bothy in the … valley is now coming close to stealing my bothy appreciation heart. I visited on the same January weekend a year later with my good friend Heather and, once again, a marvellous and unexpected time was had by all (well by us at least!) 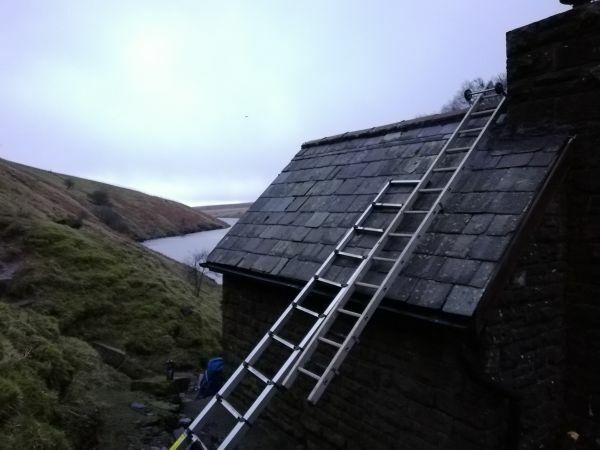 We set off late up the hill from the car park below the Grwyne Fawr Reservoir but managed to arrive, laden with coal, logs, kindling and duck breasts (as you do) at the bothy before dark (a first for Heather and I). On the way up the valley-side path, which offered most excellent views, we met several other happy travellers. The first was a young lad who stopped for a chat as he overtook us and was also heading bothyward. The next group of people puzzled us as they walked towards us down the hill. We could see what looked like big green oak beams strapped across their rucksacks and one of them was pushing a wheelbarrow. The fact that they were moving so well with their huge oak burdens added to our confusion until we realised (and they explained) that the oak was in fact cardboard filled with old flue pipe, the wheelbarrow was full of an old stove and this was a team of fabulous Mountain Bothy Association volunteers who had just installed a new stove at the bothy. Once the bothy attendance had been whittled down to 5 and the last of the day’s cement swept out, we squashed into the bothy and started those traditional bothy customs of sharing stories, sharing whisky, sharing benches and sharing duck breasts. The new stove was doing such a good job that we had to keep rotating away from the seats next to it and a couple of times even had to open the door (which involved a fair amount of standing up and chair moving). You are wondering, I am sure, where the duck breasts come into this story… I have more to tell… and will do so very soon!